Melt margarine in large saucepan over medium heat. Add onions and sauté until translucent, about 10 minutes. Stir in flour and curry powder and cook 2-3 minutes. 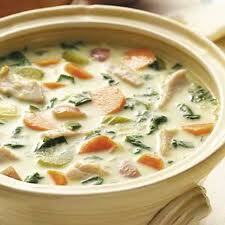 Add broth, potatoes, carrots, celery, parsley, and poultry seasoning or sage and bring to a boil. Reduce heat to low and cover and simmer 10 minutes. Add turkey, half & half, and spinach. Cover and continue simmering until heated through, about 7 minutes. Do not boil. Season with salt and pepper. In the recipe for Turkey Vegetable Soup there is no sage in list of ingredients. Just wanted you to know of typo error. Not sure of why the spinach either but guess I will have to try it to see how it adds flavor to the soup. Hi Elaine…thanks for catching that…the recipe calls for EITHER poultry seasoning OR sage, and we always use poultry seasoning, so just missed that. Hope you had a great Thanksgiving! Always great to hear from you Elaine!